As a dietary supplement for adults, take 1 serving 8-10 oz. of water once daily, 30 minutes before activity. Never consume more than 1 serving in a 24 hour period. Do not take within 4 hours of bedtime. Read warnings and only use as directed. DO NOT TAKE SPEED XTREME™ IN EXCESS OF ITS RECOMMENDED DOSAGE. SPEED XTREME™ is not intended for use by persons under the age of 18. Do not consume caffeine from other sources, including but not limited to, coffee, tea, soda, and other dietary supplements or medications containing phenylephrine or caffeine. Do not use SPEED XTREME™ for more than 8 weeks. Consult with your physician prior to use if your pregnant or nursing, or if you are taking medication, including but not limited to MAOI inhibitors, antidepressants, asprin, non-steroidal anti-inflammatory drugs or products containing phlyphrine, ephedrine, pseudoephedrine, or other stimulants. Consult your physician prior to use if you have a medical condition, including but not limited to, heart, liver, kidney, or thyroid disease, psychiatric or epileptic disorders, difficulty urinating, diabetes, high blood pressure, cardiac arrhythmia, recurrent headaches, enlarged prostate or glaucoma. Discontinue 2 weeks prior to surgery or if you experience rapid heart beat, dizziness, severe headaches or shortness of breath. THIS PRODUCT CONTAINS CAFFEINE. How should people take Speed Xtreme? Take 1 scoop 30 minutes before activity and do not exceed more than 1 scoop in a 24 hour period. Should people take Speed Xtreme with food? Speed Xtreme is best taken with food but can be taken on an empty stomach if desired. Can I take Speed Xtreme with other Genomyx products? 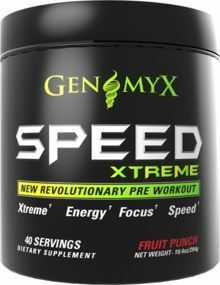 Yes, Speed Xtreme can be taken with all non stimulant Genomyx products.